Run Time: Approx. 180 min. The mind of Neil Gaiman must be a very odd place. The comic book guru, creator of the landmark series Sandman, and Death: The High Cost of Living, has a penchant for the bizarre, for darkness, and the twisted macabre. His most recent work, the gothic American Gods, is one of the most unsettling novels I've read in years. It isn't exactly scary, but the premise is so grandiose and outlandish, and the world he creates so complete, that I got caught up in the story every time I picked up the book. His other full-length novel, Neverwhere, works much the same way. It's an intriguing story of another world lurking beneath modern London, a sort of Alice in Wonderland filtered through the mind of a psychopath. I read the book before I ever knew that it was an expansion of a miniseries Gaiman had created for the BBC, and watching the TV version is like walking around in the novel, or taking a stroll through Gaiman's head (and it is an odd place). Richard Mayhew (Gary Bakewell) is our Alice. He's a dull guy, a burnt-out ad exec trapped in a loveless engagement, but his life gets a lot more interesting the night he finds a beautiful woman lying bleeding in the street and brings her home. This is Door (Laura Fraser), an aristocrat in London Below (the existence of which is news to Richard). She barely escaped the murder of her family by two jovial assassins, the cheery Mr. Croup (Hywel Bennett) and the dour Mr. Vandemaar (Clive Russell), and she hides out in Richard's apartment when they come looking for her. The story doesn't end for him after she leaves�the next day at work, Richard finds that none of his old friends remember him, and few even notice him. By helping Door, he became a resident of London Below, and all but invisible to the world above. This six-episode series, which aired on British television in 1996, follows Richard's adventures through London Below. As he tries to help Door discover who killed her family, hopefully regaining his own life in the process, Richard encounters many wonderful and terrible characters, from the brave Hunter (Tanya Moodie), Door's bodyguard, to the charismatic opportunist, the marquis de Carabas (Paterson Joseph), who trades in favors and might be Door's only hope of survival. Gaiman is great at creating wondrous worlds and compelling characters, and Neverwhere offers an imaginative twist on London's geography, playing around with the names of subway stops. Knightsbridge becomes a treacherous passage across a dark chasm, Earl's Court the home of an eccentric duke, Angel Islington a literal being, and Down Street a passage to underground caverns. Many of these geographical puns will be lost on American audiences, but the world they inhabit is no less vivid because of it. The production design is visibly limited by the miniscule BBC budget, but still appears rather lavish and unique. Sadly, Gaiman doesn't prove as adept at compressing an unwieldy narrative into half a dozen 30-minute episodes. Neverwhere feels alternately rushed and sluggish, suggesting some wonderful scenes, but often delivering material that feels truncated and incomplete. Door and Richard are nicely developed; other characters come and go but fail to make an impression. The ending feels rushed, and the big battles, already limited by budgetary constraints, never have the dramatic impact they should (it doesn't help that the horrific Beast of London looks like a slightly annoyed cow). Still, Neverwhere is worth seeing. It's a hip and ambitious offering from the BBC, with a strong cast (particularly the magnetic Paterson Joseph as the marquis), and it's one of the few filmed versions of Gaiman's works�for now (the film of the book Good Omens, which Gaiman co-wrote with Terry Pratchett, seems cursed, but we can look forward to a partially animated version of his children's book, Coraline, and his directorial debut with Death: The High Cost of Living). 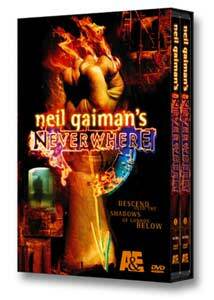 Gaiman was displeased enough with the series that he expanded it as a novel, but it holds up well on DVD. Image Transfer Review: If you make allowances for that fact that Neverwhere is a low-budget BBC production, you'll be pleased with its appearance on DVD. Colors are somewhat flat and subdued, as the BBC generally shoots on video, but the source print is clean and shows decent black level and shadow detail. Reds and whites bleed a bit, but most scenes look stable. I noticed no significant artifacting, just a bit of aliasing on hard edges in complex shots. Audio Transfer Review: Audio is offered in a fine stereo mix that offers an enveloping audio presentation, despite the lack of input from the surrounds. Speech is clear and always sounds natural, and the music and sound effects come alive in the front mains with good stereo separation throughout. LFE is lacking, and the synth score has a tendency to sound rather thin, but otherwise, this is a nice track. Extras Review: A&E includes a nice package of extras for this cult release, but the major one, commentary from Gaiman on all six episodes, will probably disappoint most fans. His comments are sometimes interesting, but he gets repetitive (spending a lot of time discussing location scouting and production design). His candor is appreciated�he comments on things he isn't happy with�but overall, the tracks are slow going. The oddly titled Original BBC Neil Gaiman Interview is better. It runs 22 minutes, and covers the most interesting bits of the commentary (the genesis of the project, the casting, and filming technicalities) in a more concise fashion. Unfortunately, whoever edited it went a little overboard with the creative cutting, imitating the annoying Neverwhere opening sequences. Also included is a detailed bio of Gaiman, descriptions of nearly every major and minor character (though many of the more awkward passages are taken from Gaiman's novel, including one that describes Hunter as a combination of "Emma Peel, Bruce Lee, and a particularly vicious tornado, all rolled into one and sprinkled with a generous helping of a mongoose killing a king cobra. "), and a photo gallery. The set is nicely packaged, with two Amaray cases fitting into an attractive slipcover. No subtitles are included, but each episode is broken into a generous six chapter stops. Neil Gaiman's Neverwhere is as imaginative as anything else that has sprung from the mind of the mad genius, but as a TV production, it feels somewhat limited by time and budget. If you've read the novel, you'll probably like the series a bit more; if you haven't, go in with an open mind. A&E has done a fine job with this two-disc set, so no complaints there.